​The Nature Conservancy's few public preserves in the state of Georgia. The trail got its name from a gigantic Short-leaf Pine found along the trail. In addition to discussing trees, forests, and wildlife, the Braille signs indicate many possible sensory experiences, including walking in the crunchy leaves at the bottom of a shallow streambed and feeling soft mosses at the bases of trees. To view the content from the Big Pine Braille Trail's informative signs on a web page, click HERE. To view the content from the Big Pine Braille Trail's informative signs in a Microsoft Word document, click HERE. ﻿Marshall Forest is open to the public during daylight hours without a reservation. The Big Pine Braille Trail is located off of Horseleg Creek Road in Rome, Georgia. The trail offers different sensory experiences at different times of the year. Have a great trail walk! 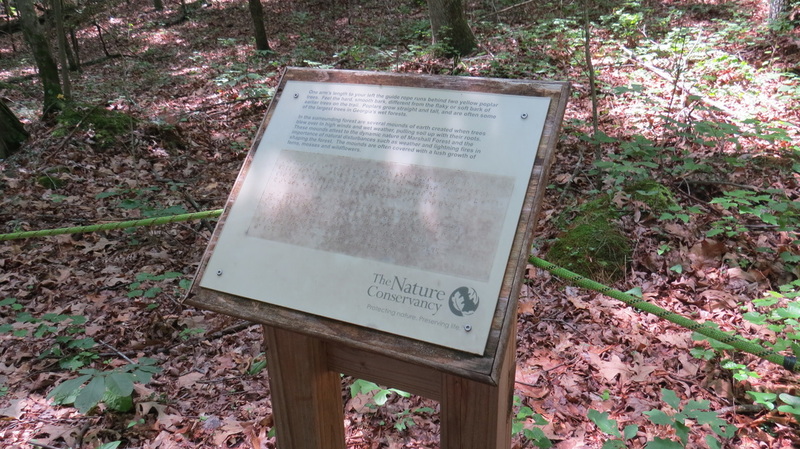 For information about the history of Marshall Forest, click HERE.